In these times of verbal excess and rapidly increasing venues for excess verbalizing, idle threats are at an all-time high. But there have always been idle threats. In the past it was just harder to find and expose them. Over the weekend I was flipping through my many channels of HBO when I came across the movie Running Scared. Or that was what it said at the bottom of my TV screen. But the grainy, quick-cutting images didn't match how I remembered the film. 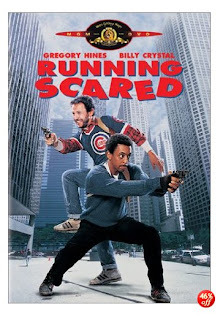 In fact, what I was watching was Running Scared 2006, which bares no relation to the 1986 hit starring Billy Crystal and Gregory Hines. In the 1986 title Crystal and Hines are hard boiled police detectives from the South Side of Chicago who pursue a drug lord played by Jimmy Smits. Being of the inter-racial law enforcement comedy-dramas that dominated the 80's, the movie is full of the belly-exposing half-shirts, awkward high-fives and wanton police brutality you've come to expect from that genre. The sound track is spectacularly powered by the medium-paced groove of Yacht Rock legend Michael McDonald's opus Sweet Freedom. Yet here was the bantamweight comic and waif-like dancer throwing the bad guys against cars and kicking down doors. Granted Hollywood has always taken some liberties with the size-to-strength ratio of its heroes, and the right kind of acting can make the Pesci or Pacino-like smaller man legitimately intimidating, but this, this was ridiculous. If we'd kept down the path established by Running Scared today we'd have ultimate fighting movies staring Sean Austin and Elijah Woods and Hobbit movies staring Vin Diesel and The Rock. These days if a scrawny dancer or joke-teller found himself cast in a cop movie he'd be spending at least six weeks with a personal trainer. And, recognized 21 years later only because a completely unrelated film stole its name, Running Scared's threat to bring an egalitarianism of body mass to all movie roles captures Idle Threat of the Week for May 7th to 13th. If you want a newly minted film with comically undersized tough guys, watch Brick.